Resveratrol is a compound found in the skin and seeds of grapes. Researchers have been mystified for years about how the French can smoke cigarettes and eat high-fat foods, yet still have extremely low rates of cancer and heart disease. They call it the French paradox. Harvard researchers Dr. Christoph Westphal and David Sinclair conducted genetic research to investigate the French paradox. Until now, scientists believed drinking red wine had health benefits*... but couldn’t put their finger on exactly why. The biggest hurdle with resveratrol is finding a way to consume the large concentrations required to provide you with a benefit. You’d need several bottles of wine per day to get the anticipated benefit from resveratrol. Drinking large amounts of wine or other alcoholic beverages will increase your insulin levels, which will eventually have a negative impact on your health in a number of ways. I’ll tell you in a minute how you can get your highly-concentrated resveratrol without the alcohol, sugars and calories of red wine. Every day of your life you face exposure to dangerous free radicals. No matter how healthy a lifestyle you lead or how healthy your diet is, this is simply a fact of life. Fortunately this is not all bad - as your normal bodily functions (breathing, metabolism, and physical activity) naturally generate free radicals. Your immune system also generates free radicals to help neutralize viruses and bacteria. The problem starts when these free radicals attack your healthy cells and cause them to weaken and become more susceptible to health disorders. Plus, this can also have a profound effect on how you age. With an overall 3,500 ORAC (Oxygen Radical Absorbance Capacity) value per capsule, Purple Defense capsules provide a powerful natural antioxidant blend. ORAC values can easily be inflated with any machine though. Using an ethanol solvent will artificially inflate the ORAC value. That's why each batch is testing using an acetone/water solvent. So you can rest assured that you're actually getting 3,500 in each dose. Plus, free radical damage accumulates with age. So, the longer your lifestyle and environment expose you to this damage, the greater your consequences as you age... the greater potential consequences to your overall aging process. Well, first of all, it would be helpful to address the unhealthy habits listed above. Additionally, consider going the next step and find ways to fortify your healthy diet with antioxidant rich food. I’m sure you’re well aware of the benefits of antioxidants from all the discussion on my site. I’ve spent literally decades researching this topic and cannot stress their importance to you enough. Antioxidants provide your body with natural protection against free radicals and help you neutralize and keep them under control. Antioxidants are generally classified into two broad categories... lipid soluble (hydrophobic) and water-soluble (hydrophilic). Lipid soluble antioxidants - These are localized to cellular membranes and lipoproteins. They protect cell membranes from lipid peroxidation. * Examples of lipid-soluble antioxidants include... vitamins E, A, and beta carotene. Water soluble antioxidants - These are present in aqueous fluids, such as blood and intracellular and extracellular fluids. They react with oxidants in the cell cytosol (fluid portion of cytoplasm) and the blood plasma. Examples of water-soluble antioxidants include... vitamin C, glutathione, and catechins. There are many sources of antioxidants available to help boost your health. Most of these sources come directly from consumption of high quality, fresh, organic and preferably locally grown vegetables and fruits. But there is a catch. The catch is that, to get the most potent antioxidant content from the fruits and vegetables - they need to be organically grown and processed. The key to all this is a large family of natural antioxidant compounds called polyphenols. Polyphenols exist in plant floods and their contribution to the antioxidant capacity of the human diet is much larger than even that of vitamins. And a subclass of this antioxidant-rich family found in fruits and vegetables is flavonoids. Plants exposed to pesticides and herbicides have less of a need to produce such compounds. And therefore, these plants produce fewer antioxidants than organically grown food. Fresh organic foods are important not only for what they give you, higher levels of antioxidants and nutrients, but also for what they don’t give you... exposure to pesticides, herbicides, and non-organic fertilizers. Now let’s take a closer look at some common and not so common food sources of antioxidants - keeping in mind that for you to receive the highest antioxidant potential, organic is best. A specific polyphenol flavonoid compound called quercetin is a potent dietary antioxidant found in certain berries: lingonberries, cranberries, bilberries, and black currants. Not only do berries contain many flavonoids like quercetin, but also fiber... vitamin C... and other nutritious antioxidant-rich polyphenol compounds. Ideally, berries should be eaten raw and as you already know - organic is best. Another great source of water-soluble antioxidants in berries is from blueberries. In fact, Europeans recognize their bilberries as blueberries. Only a few years ago, the USDA Human Nutrition Center (HNRCA) ranked blueberries #1 in antioxidant activity. This research compared 40 other fresh vegetables and fruits. This is all great but there is a red flag I have to raise - watch out for too much sugar. If you overdo your fruit consumption, even berries, you risk releasing too much sugar into your system. This could cause your insulin levels to rise and eventually your health could worsen instead of improving. So, moderation is the key when eating fruit. Choosing fruit relatively low in sugar, like blueberries, should not only boost your antioxidant intake but help keep your insulin levels in check as well. Eat Your Veggies for Healthy Antioxidants - but Which Ones? Broccoli, greens, beans, artichokes, and onions, to name a few, are good sources of polyphenol flavonoids. And of course, raw organic vegetables help you maximize the antioxidant benefits. However, just like you need to be careful on how much and the types of fruit you eat, the same holds true with vegetables. For example, from the USDA Human Nutrition Center research, potatoes ranked high on the list of vegetables with potent antioxidant content. But they are not necessarily your best choice because they may cause increased insulin levels. In order to determine the amount of fruits and vegetables your body requires, I recommend you first determine your Nutritional Type™ (NT). You see, foods and individual nutrients do not behave the same way in two people with different Nutritional Types. Your Nutritional Type determines your individual nutritional requirements and dictates your individual responses to what you eat and drink. Please check my site for more details on how to determine your NT. It’s well worth your time. Here’s a great table showing examples of fruits and vegetables along with their polyphenol content. Remember, polyphenols are natural antioxidant compounds that help you neutralize free radical damage. This table also shows another beneficial subclass of polyphenols called phenolic acids. Note: Table adapted from The American Journal of Clinical Nutrition. Why Not Add a Little Spice to Your Life and Health? A bountiful source of antioxidants that many people don’t know about is herbs and spices. Researchers within the U.S. Department of Agriculture discovered that herbs are an abundant source of antioxidants - not to mention how they make your food tastier. According to the research, on a per gram fresh weight basis, oregano and other herbs ranked even higher in antioxidant activity than certain fruits and vegetables. And there are other herbs and spices that pack an antioxidant punch as well: cloves... turmeric... cinnamon... garlic... basil... and curcumin... to name a few. Herbs and spices have emerged as a quick and convenient way for you to get a concentrated source of antioxidants - without all the extra calories of many foods. Now, your key to taking advantage of the antioxidant activity from herbs and spices is to find an organic source and consume them fresh and raw. For example, the antioxidant activity of fresh garlic is 1.5 times higher than dry garlic powder. Just as consuming too much of any food product can carry health risks, herbs should be used with moderation... and only as a complement to your healthy diet. So, add a little seasoning and spice to your life and feel good about the antioxidant benefits they provide you. Maybe All You Have to do is Drink a Glass of Red Wine Every Day? Many folks believe that a good way to promote your health is to drink a glass of red wine on a regular basis. Certainly there’s the “French Paradox” theory... the observation that French people with poor diets who drink wine have better cardiovascular health than you might expect. This opinion happens to be based on a potent polyphenol found in red wine and grape skins called resveratrol. But, with all this said, resveratrol is such a powerful water-soluble antioxidant that there must be a way you can benefit from it without taking undo risks. This potent antioxidant is somewhat different from the rest. It not only helps you neutralize free radicals, it can cross the blood-brain barrier to help protect your brain and nervous system as well. Now that I’ve clearly identified resveratrol as one of your best water-soluble antioxidant sources, there’s still an open issue... what’s the best way to make sure you consume enough of this antioxidant? To me, one of your best sources of resveratrol is from grapes themselves. But, just like there are issues with other fruits, vegetables, nuts, and red wine, such is the case with grapes. See, the skin and seeds of the grapes provide you with the most potent supplies of resveratrol... not the fruit itself. The meat of the fruit contains sugary fructose which could raise your insulin levels. There’s not really an issue with eating the skin - as you consume it when eating the fruit. But the seeds are another issue. Most people don’t like to eat the seeds as they tend to be tough and have a somewhat bitter taste. And some grape processing actually removes the seeds prior to distribution at your local store. So, now what can you do? Well, if you cannot find a good source of grapes with the seeds still intact, or even if you do locate a source but you don’t want to eat the seeds, I have another alternative for you. Even if you find a raw source of grapes, there are major advantages in store for you when using Purple Defense grape seed. See, it’s almost impossible for you to chew the seeds enough to get the equivalent benefit you can from the pulverized seeds in Purple Defense. Why? Pulverizing the seeds makes them more digestible. * This process increases the surface area while leaving the product nutrients intact. Available all year round - Long after fresh grapes have disappeared from local fruit stands and produce departments, Purple Defense grape seed is available. Longer shelf life - Since this grape seed lasts a full 12 months from the date you receive it, you’ll cut back on the amount of fruit you waste. No refrigeration required for Purple Defense. Avoid chewing bad-tasting seeds - Remember, it’s the pulverized seeds that provide you the greatest antioxidant benefit. * So, using this convenient grape seed powder in capsule form provides you a great solution. * Plus, it means you don’t have to chew any bad-tasting and tough seeds. So, now you see some of the reasons why I highly recommend Purple Defense as one of your best antioxidant sources. And of course, as I continually stress on my site, no supplement replaces a healthy diet of wholesome, unprocessed foods. But this grape seed powder is an excellent complement to your healthy diet in providing you free radical protection. 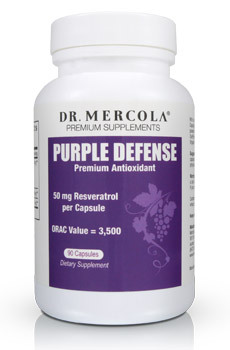 Each capsule of Purple Defense contains the amount of resveratrol that is in thirty nine 8oz glasses of wine. But more importantly it is there as a whole food complex along with other fruit complexes that allow the synergistic combination of all the micronutrients to give you the full benefit that the food would give you if you ate it naturally. You see I am somewhat skeptical of scientists that isolate single nutrients with the belief that the isolated nutrients are providing all the benefits. In my mind the whole food complex is nearly always superior. Purple Defense is rigorously tested for quality, potency and purity. Purple Defense grape seed does not require refrigeration. When stored properly, you'll find it will last up to one year. No known drug interactions (however, those allergic to grapes should not take grape seed). Believe it or not - you have quite a few choices for grape seed out there today. So, what makes the Purple Defense grape seed formula stand out from the rest? First of all, I chose a formula with a proprietary process called OxyPhyte®. This unique process concentrates the antioxidant power of specific compounds. It does this by extracting the phytonutrients responsible to provide you maximum antioxidant activity. The bottom line - the OxyPhyte process used to formulate Purple Defense helps provide you with very high potency water-soluble antioxidants from the grapes. Not all grape seed formulas use this process. OxyPhyte grape skin extract - Along with the grape seed, combines to deliver a potent formula of 10% resveratrol... the one polyphenol I insisted needed to be in the formula. Organic black currant - This organic powder provides added healthy nutrients and quercetin, a polyphenol compound with potent antioxidant activity* (mentioned above). So, the Purple Defense formula even goes beyond nutritious grapes in providing you additional sources water-soluble of antioxidants and nutrients. But, how do you know how well these antioxidants work against free radicals? Over a 138-year timeframe, the U.S. Agricultural Research Service (in-house arm of the USDA), developed a method to determine free radical scavenging activity against the peroxyl radical for both water-soluble and lipid-soluble substances. For example, here’s a chart showing Purple Defense nutrients and their potent Oxygen Radical Absorbance Capacity (ORAC) values (on a per gram basis). And with the total combination of grape seed extract, grape skins, black currant extract, and plum extract, Purple Defense is certainly up to the task. But high and consistent ORAC values aren't all that's important in a supplement. You need to be certain that your supplement adheres to the highest standards. That's why Purple Defense is manufactured at an NSF certified plant. NSF International is an independent, not-for-profit organization. This body of audit and inspection is one of the most comprehensive and quality driven initiatives in the nutrition industry. They work hard to make sure that you don't have to question the safety -- or quality -- of your product. So basically, NSF certification means superior quality control. NSF means you can rest easy. The ingredients are checked many times throughout the process for contamination that could occur at any point during the manufacturing process. To be certified NSF, a company has to maintain appropriate heat and humidity throughout the process. Failure to adequately maintain those can radically decrease the quality of the supplement. You’ve discovered many choices when it comes to protecting yourself from free radical damage. There are many foods that provide you very good sources of polyphenols and potent antioxidants to help you neutralize the damaging affects of free radicals. So, I recommend you consume these foods in moderation due to the health risks described above. And your preference should always be for fresh, organic, and raw sources. At the same time, complement your wholesome diet with Purple Defense, your #1 source for water-soluble antioxidants. 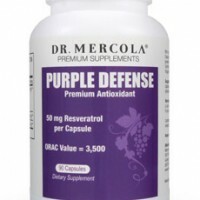 And just so you know, my NEW and IMPROVED Purple Defense formula now provides higher levels of resveratrol content and ORAC value... you now get 20% more resveratrol and double the ORAC value. So, don’t wait until free radicals rule your body and your health, order Purple Defense today.